The Eliet BL 360 is highly manoeuvrable, lightweight and gets into the smallest corners. The broad turbine reduces noise, which significantly increases comfort of use. Thanks to the anti-vibration handlebar, the Eliet BL 360 is a true pleasure to work with. This small wizard is available with a power source from 5 to 6.5 hp. A fan rotates at approximately 3,000 rpm in the turbine housing in order to develop the powerful blowing action. Then it is reassuring to know that you have purchased a robust machine. ELIET did not leave anything to chance when constructing this leaf blower. The thick sheet steel turbine housing is even designed to withstand a heavy impact. A fan impeller, 300 mm in diameter, rotates within the volute housing that has a diameter of 360 mm. The fan impeller blades have a special shape that dampens fan noise. As this impeller is manufactured from light aluminium, this has a beneficial effect on fuel consumption. Accurately balanced to within one gram, this fan offers an extremely low vibration level. Unlike other blowers, the multifunctional blower nozzle on this ELIET blow machine is unique. This recent development has enabled the lateral direction of blowing to be quickly switched to a forward direction. With the forward direction of blow selected, the airflow is divided so that part of it is diverted to clear a lane the same width as the machine at the front right. The two air deflectors in the lateral air duct can be adjusted with a lever on the handlebar. This lever enables you to easily adjust the direction of the airflow in order to dislodge and blow away leaves. Despite its low weight and compact dimensions, the BL 360 is equipped with large pneumatic tyres. 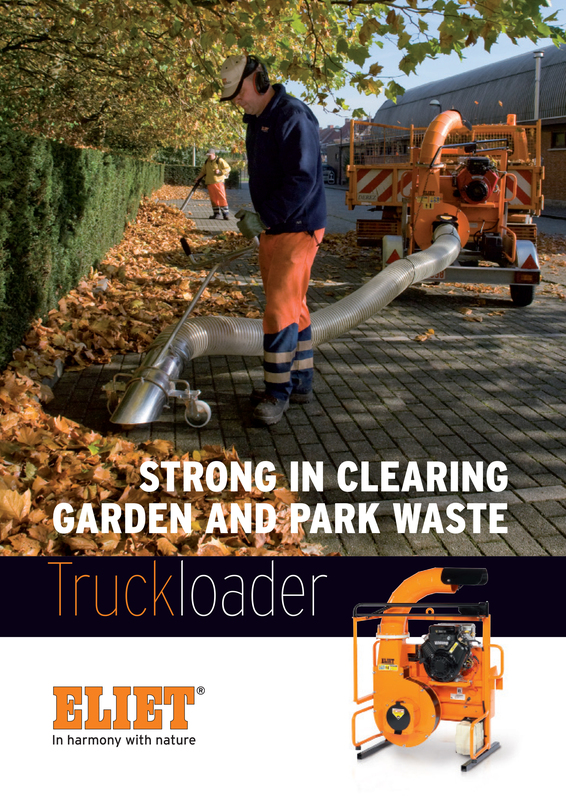 This makes the machine extremely manoeuvrable on any type of ground. Typically, this machine runs on the large pneumatic tyres as it is designed to be well-balanced. The fixed wheel at the front only acts as a shock-absorbing wheel.